Welcome back Thai Sanctuary Massage at Raintree! As of February 1st, we are excited to re-introduce our Thai Sanctuary Massage to our body treatments! We know at a lot of our guests are eagerly awaiting the return of the Thai treatment and we couldn’t be happier to re-introduce this truly exceptional experience for our guests. 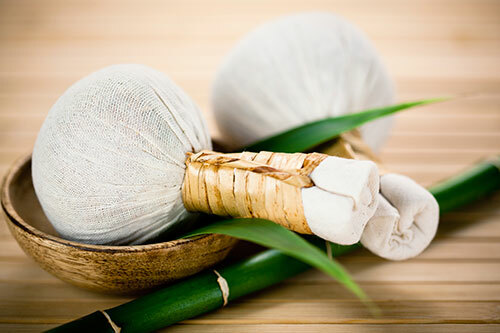 For those that are new to this exceptional body treatment, you can expect to be enveloped in a cloud of warmth through the steam in our Vichy room as we apply centuries old massage techniques to stretch and relax the body using traditional Thai herbal stems for a full body experience. Traditional healing herbs and oils are wrapped in cotton and steamed to release their natural oils and are applied all over the body, helping to release toxins, increase circulation, while relieving deep seated muscle tension. Drawing from various components of massage modalities, this unique therapeutic massage incorporates stretching, shiatsu, acupressure, Swedish massage and traditional Thai techniques. The combination of soothing moist heat with therapeutic natural herbs and their inherent essential oils creates a deeply rejuvenating treatment with extended benefits to the body and mind. WHO WOULD BENEFIT FROM a THAI Sanctuary MASSAGE? This 1 hr, 30min treatment is exceptionally well priced at $138. An elevated experience offered by the talented and professional team at Raintree Wellness Spa.